Block the Sun, Fly your Custom Shade Sail and Enjoy being Cool. We offer Custom Shade Sails made of Commercial 95 Shade Fabric to fit almost any size and shape. Also known as Sun Sails, shade sails make beautiful additions to your patio, backyard, swimming pool, or outdoor living area. Floating and curvaceous, shade sails make an attractive addition to any property, and with the right design can enhance the existing property with architectural and artistic flair and style. They provide excellent protection from the sun and its harmful UV radiation. A shade sail is the perfect alternative to a traditional pergola or covered porch and much more affordable. Sail Shades are wonderfully versatile; they can be attached to homes, 12 inch diameter or larger trees, or wood / steel posts. In addition, they can be supported by wood posts or steel columns embedded in concrete footings, and can also be taken down seasonally as required. The perimeter of each sail is designed with a gentle curve inwards towards the center of the sail to control fabric tension. This inward curve will have a maximum depth, or gore, of approximately 6-10% of the length of that side of the shade sail. Therefore, when tension is placed on the shade sail, the fabric will not wrinkle. Shade sails, when installed properly, do not sag or flap in the wind. CAUTION: If the area you wish to shade is much longer on one side and not very wide on the other, the inward curve could protrude far enough into the sails shape to make long/skinny Rectangles with very little shade area in the middle, or with Triangles it will made the long corner into a skinny strap, possibly making it useless for shade, but could be an interesting decorative/design feature. So please be careful when designing your shade sails. 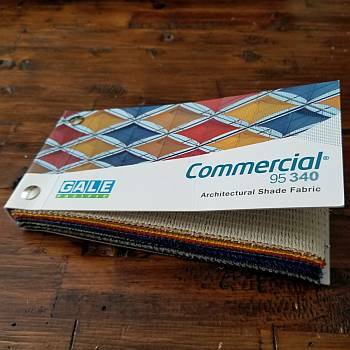 Commercial 95 fabric by GALE Pacific Commerical (Formerly Synthesis Fabrics) - Mesh material is a 340 grams per square meter high density polyethylene knitted fabric specially designed to breathe and keep you cooler and more comfortable in hot weather. It blocks up to 98% of the harmful UV rays of the Sun, yet remains totally unaffected by moisture and natural temperature extremes. And because the Commercial 95 fabric is knitted, not woven, it will not tear or fray. 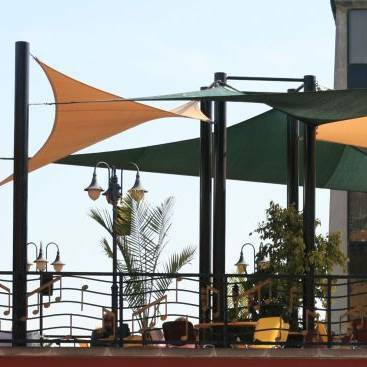 Shade sails have reinforced webbing around the perimeter and a stainless steel ring at each corner. The material, itself, is waterpoof, but will allow water to pass through it as it is a mesh material. 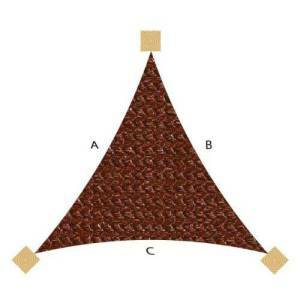 Due to the available Commercial 95 fabric widths, your shade sail may have seams which is normal. This helps to minimize fabric waste and helps to keep fabrication costs to a minimum. 1O Year Limited Warranty - Fabric is warranted against rot, mildew and undue fading for 10 years. 2-year warranty on defects in materials or workmanship. 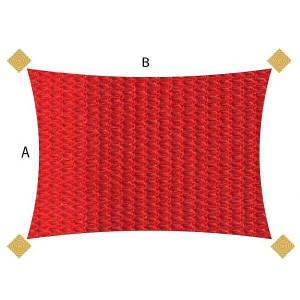 Residential Sail Corner with 1.5 inch webbing. 1.5 inch webbing is rated up to 1,800 pound break strength. Typically used for residential shade sails up to about 185 square feet for 3 corner sails, and up to about 240 sqft for 4 corner sails. Heavy Residential/Light Commercial Sail with 2 inch UV inhibitive reinforcement webbing. Starting at just $3.45 per square foot. 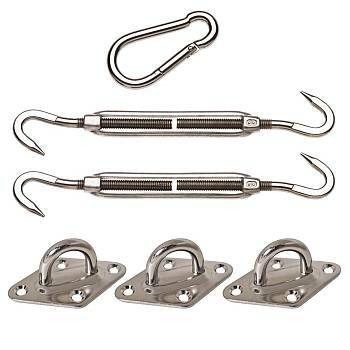 Light Commercial Sail with 1/8 inch steel cable reinforcement. 1/8 inch cable has a 400 pound work load strength and a 2,000 pound break strength. 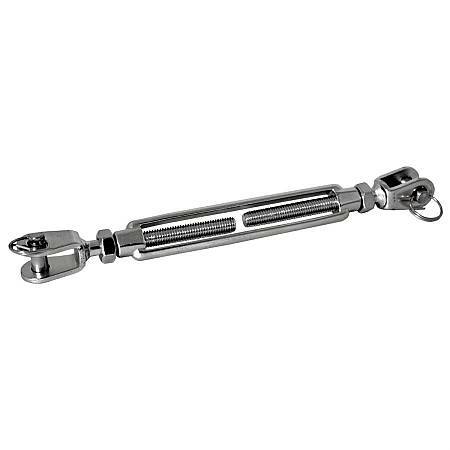 Used for smaller commercial applications where a steel cable is required. 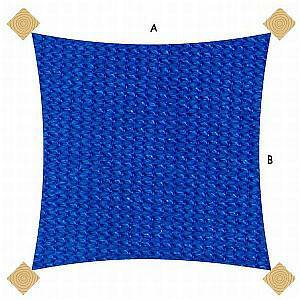 For use in sails up to 200 square feet with 3 corners or up to 270 sq ft with 4 corners. Starting at just $4.00 per square foot. Commercial Sail with 1/4 inch steel cable reinforcement. 1/4 inch cable has a 1,400 pound work load and a 6,000 pound break strength. 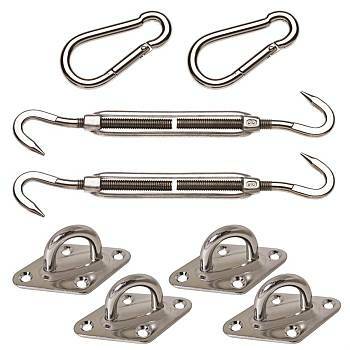 Used for larger commercial applications where a steel cable is required. For use in 3 corner sails up to 620 square feet and up to 820sf for 4 corner sails. Starting at just $4.60 per square foot. 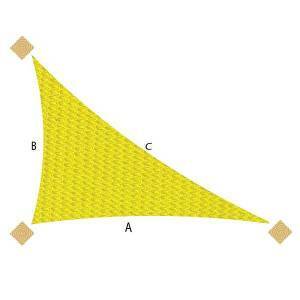 Note: Some shade sail shapes and sails with additional corners will have additional costs. There is also a 50 square foot minimum charge for any custom shade sails. We strive to offer custom made shade sails at an economical price without sacrificing any quality in our materials or workmanship. Mounting hardware is not included with the sail. 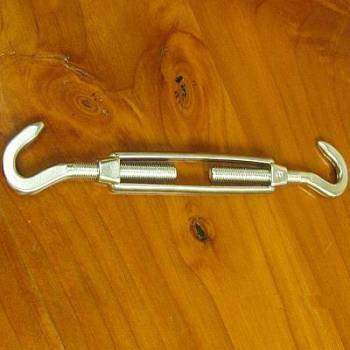 Typical mounting hardware is available below, or can be found at many local hardware stores. Fill out your Custom Shade Sail Quote Form today! It will take approximately 1-2 business days to process and quote the shade sail you need. All custom shade sails are made to your specifications. All sales are final. No refunds or returns can, or will, be accepted.